For as long as I’ve eaten a plant-based diet, I’ve been asked the same question, over and over again, in every country I’ve visited and in every language I speak (which is four). It amazes me how incredibly misinformed the world is about protein and the sources of it. Most people imagine that you can only find protein in animal products and completely overlook the overwhelming amount of plant-based foods that are rich in this highly important nutrient. Not only are people misinformed about the variety of protein sources that exist, they also believe that our bodies need a vast amount of it and assume that if you’re a vegetarian, vegan and on a plant based diet, it’s impossible for you to get enough. While it’s certainly important to get the right amount of protein, the average omnivore consumes far more than their required daily intake. According to Kiss Carr, you need 0.36 grams of protein for every pound of body weight, on average, which increases to 0.45 grams for physically active athletes. There are many ways to get this protein in your diet through healthy plant based sources, whether or not you’re vegan, vegetarian or on a plant based diet. There are more plant based sources of protein than I can ramble on about, but some of the most significant ones are grains like millet, amaranth, oats and quinoa, lentils, beans and legumes, seeds like chia, flax, hemp, pumpkin, sunflower and sesame, nuts like almonds, walnuts, pine nuts and cashews, soy products likes tempeh and tofu, leafy greens like kale and collard greens and mushrooms. 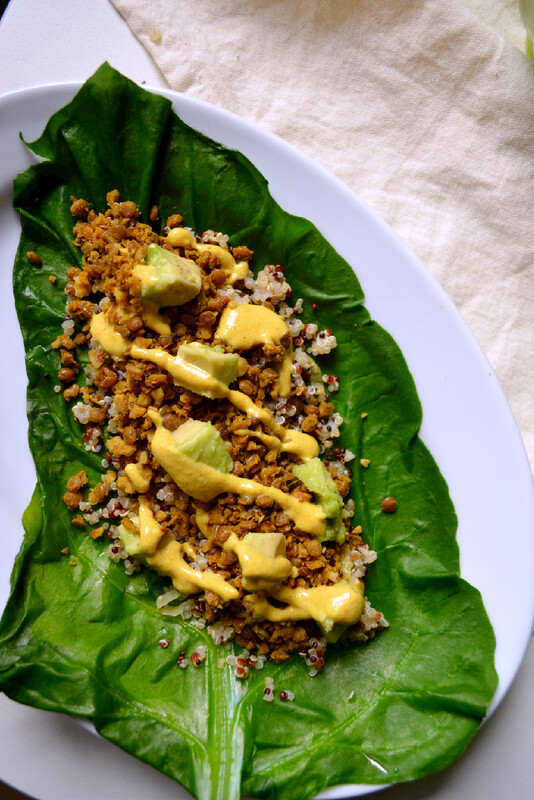 These chard rolls are filled with quinoa, lentil-walnut crumble, avocado and a smokey cashew-hemp sauce, containing more plant sources of protein than I can count on one hand and giving you a good dose of your daily recommended protein intake in one meal. The next time someone asks you if they can get enough protein on a plant based diet, make them this! 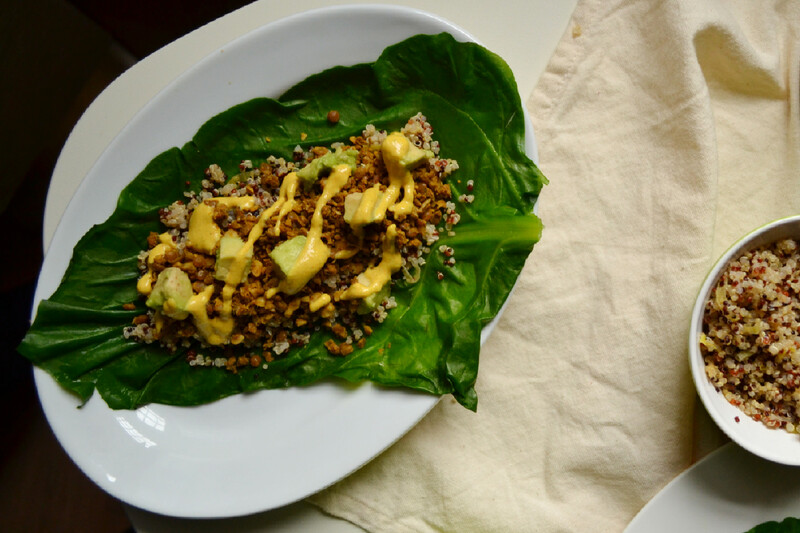 These protein packed chard rolls are loaded with the goodness of lentils, walnuts, and cashews as well as quinoa and hemp, two complete sources of plant based protein containing all nine essential amino acids. A flavour explosion in your mouth with the added benefits of heart healthy plant based protein, not to mention a variety of other minerals, vitamins and essential nutrients. Rinse chard leaves and remove stems. Bring a pot of water to boil. Add a steamer basket on top of the pot, place chard leaves inside and cover with lid. 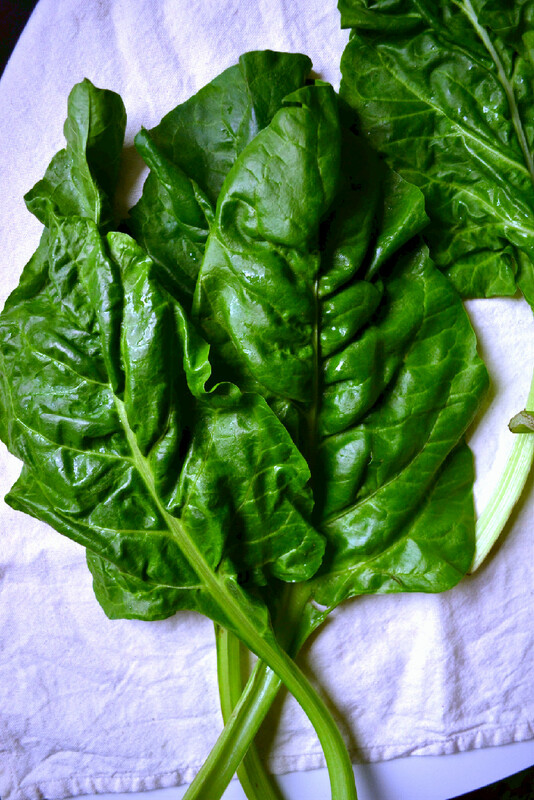 Lightly steam the chard leaves for 2 minutes until slightly softened and bright dark green. Do not over steam them or they will fall apart. you want to be able to fill and roll them. You can skip this step if you prefer them raw, but I find them more flavorful this way and easier to chew and digest. 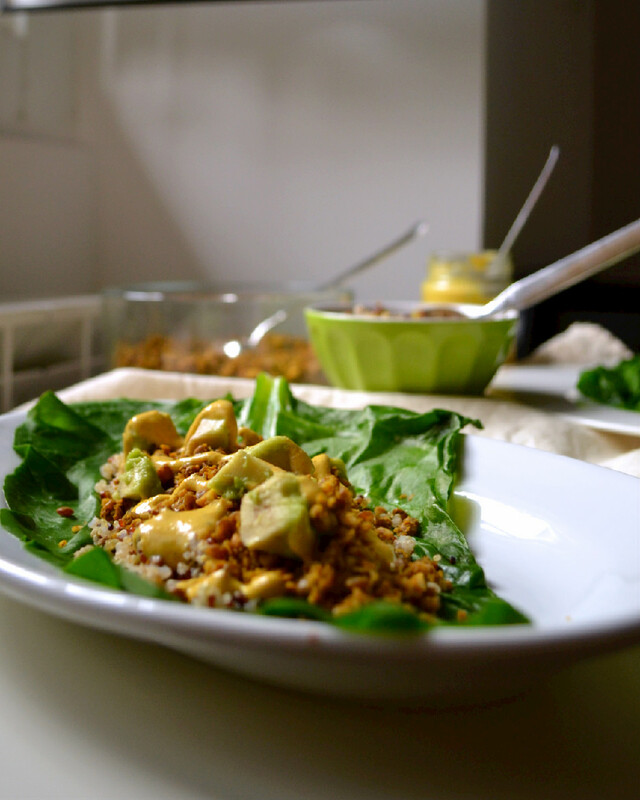 Assemble the rolls as follows, for each roll:1 chard leaf, 2 Tbsp Quinoa, 2 Tbps Lentil-Walnut Crumble, a few cubes of avocado, a drizzle of smokey cashew-hemp sauce. To roll, fold in long edges, then fold over the bottom short edge (where you removed the stem) and carefully roll up the leaf as tightly as possible without destroying it. These are best eaten immediately with a fork and knife, as they are a bit delicate to pick up. The quinoa and lentil crumble can be leftover and straight out of the fridge or at room temperature. I prefer everything to be at room temperature for these rolls as I find them most flavorful this way. Sauté leeks in extra virgin olive oil with a pinch of fine sea salt until softened and wilted. Add toasted quinoa and mix to combine. Add water and bring to a boil. Reduce heat to low, cover and simmer about 15-20 minutes until waters has been absorbed and quinoa is cooked. It should be soft yet firm and not mushy. Fluff with a fork and set aside. Serve as a side dish to any meal and use leftovers in wraps, soups, or salads. Meanwhile, heat EVOO in a wok or pan and sauté onions with a pinch of salt until translucent. Add pressed garlic and sauté 2-3 minutes. Add cooked lentils and toss to combine. Season to taste with your choice of spices and/or herbs. Dry toast the walnuts in a pan, for a couple of minutes on low heat. Set aside to let cool. Add walnuts to a food processor and pulse a few times until coarsely chopped. Add sautéed lentils and pulse a few times until mixture is combined and resembles a crumble. Do not over process as you want to leave chunks for texture. Serve as a taco or burrito filling, to make healthy vegan nachos, or for a protein packed chard roll. I ate leftovers as a snack with corn chips and the smokey cashew-hemp sauce. Blend all ingredients together in a high speed blender and serve as a vegan alternative to cheese sauce in nachos, tacos, burritos, or vegetable rolls. That cashew hemp sauce sounds soooo good! I make a recipe similar to these wraps but with more Mexican spices, my hubby loves it but it’s been a long time since I’ve made it! I top ours with a poblano cream sauce! I couldn’t stop eating it. I ate the leftover crumble with corn chips and drizzled the sauce over them like nachos….so delicious.